FILE - Employees at the Volkswagen plant in Chattanooga, Tenn., work on the assembly of a Passat sedans, July 12, 2013. Renegotiation of the North American Free Trade Agreement (NAFTA) was one of President Donald Trump's campaign promises and part of his broader push for better terms of trade for the United States. He has said that bad deals have cost millions of jobs. 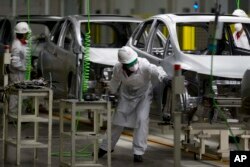 FILE - Employees work in the new multibillion-dollar Honda car plant in Celaya, in the central Mexican state of Guanajuato, Feb. 21, 2014. "All the NAFTA renegotiation efforts in the world will not create U.S. jobs, raise U.S. wages or reduce the U.S. trade deficit if the new rules do not include clear, strong and effective labor rules that require Mexico to abandon its low wage policy," Celeste Drake of the American Federation of Labor and Congress of Industrial Organizations said at a House Ways and Means subcommittee hearing. Democrats, who took control of the House of Representatives in January, have traditionally been skeptical of free trade agreements and sympathetic to labor groups. Their support is essential to USMCA's passage. USMCA requires its three signatories to maintain labor laws in line with international standards, and to enforce them. But critics have called the agreement's enforcement mechanism insufficient, saying it will still allow weak unions and resulting low wages in Mexico, while failing to stanch the flight of U.S. factories to lower-cost Mexico. "The (USMCA) labor chapter is an improvement. The problem is the enforceability mechanism," said Shane Larson, a director with the Communications Workers of America, advocating for reopening the agreement. USMCA "takes some positive steps but doesn't measure up to being able to make more good-paying jobs now and going forward," said Josh Nassar, legislative director of the United Auto Workers union. "This agreement is a continuation of the assault on the American middle class," Brian Higgins, a Democratic representative from New York, said on Tuesday at the hearing.